There are some excellent seasonal fruits and vegetables in the winter packed absolutely full of antioxidants. It’s easy to overindulge over the festive period but with a little careful planning and simple substitutions, you can add a healthy kick to every meal. 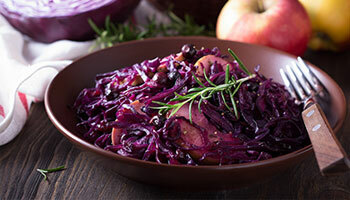 In a large saucepan, layer a third of the cabbage, onion and apple and top with 1 tablespoon (15g) of ZyloSweet. Repeat until it is all in the pan. Squeeze in the juice of three of the clementines, sprinkle over the nutmeg and cinnamon and dot the coconut oil on top. Pour in the Apple Cider Vinegar and turn the heat on low. When the cabbage mixture has shrunk down a bit, after half an hour or so, add the clove studded clementine to the pan. Stirring occasionally, this can be left for up to three hours for a richer flavour, or for about an hour until it’s soft enough to serve. Top with a handful of pomegranate seeds.